This Todd Olivas & Associates deposition conference suite is located just a short drive from the Sky Harbor International Airport and Scottsdale Airport. 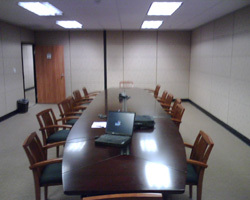 We offer an elegant deposition-taking environment for up to 15 people. We also offer videoconferencing services too. Many fine hotels and restaurants located nearby.